a nice gift to give to a friend at work or a neighbor. Just a little something to wish someone a Merry Christmas. And what’s nice about this little stocking is that it comes with the scent of Christmas. Two 6″ x 6″ pieces of white lace material. Two 6″ x 6″ pieces of white tooling material. Two Strips of off white boarder lace approximately 3 ½” x 1″ . One Strand of silver floss measuring 1′. ½ cup or so of Christmas potpourri. 1. Place the two pieces of lace together with the correct sides facing each other. 2. Place the tooling on top of each of the wrong sides of the lace. of the top and 1″ from the top of the sides of the stocking. 6. 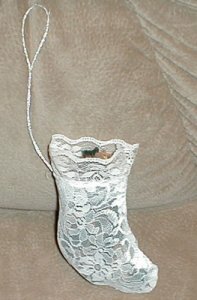 Sew the boarder lace to the stocking panels. 9. Turn the stocking inside out. and then back into the stocking to form a loop. 11. Pull strands of the floss out of the inside of the stocking and knot the ends together. 13. Fill the stocking with Christmas scented potpourri.